SagaBornBlogGamesThe Evertide RPG coming in 2019! Michael Bielaczyc and Lone Wanderer Entertainment are extremely excited to announce that we will be producing a roleplaying game based on the wildly popular book, The Summer Dragon: First Book of The Evertide, by acclaimed artist Todd Lockwood. 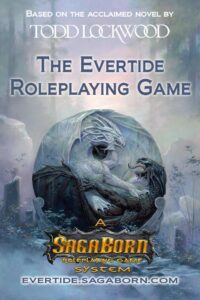 The Evertide RPG will be based on the SagaBorn Roleplaying Game. SagaBorn RPG is a D20 system focused on storytelling and streamlined rules. The Evertide RPG will be a full, stand-alone RPG system that will incorporate all your favorite things from a fantasy RPG as well as the exhilarating combat atop the backs of dragons featured in The Summer Dragon novel. Michael and the full staff at Lone Wanderer Entertainment will be working on the system, as well as Robert Schwalb (Shadow of the Demon Lord, various WoTC rulebooks), a veteran game designer who will make sure we have the best of all gaming elements. We hope to have the Beta out by late Summer, and the full book is expected in 2019! Visit the Evertide website to sign up to our newsletter and find out more!